It’s been awhile. No particular reason for the hiatus, only that the IG:Homebrewing writing/editing (coupled with grad school) earlier in 2015 increased my writing energy threshold; hence, my slowly getting back into blogging and general swing of things. No matter; while my blogosphere airwaves were mostly static in the later half 2015, I was fortunately quite busy within the homebrewing realm. Thus, with new writing lifeblood in me, in this update, I’d thought I share some recent happenings in my apartment brewing. Becoming BJCP certified is something I’ve always wanted to achieve, yet I never seemed to have the time to complete such task. 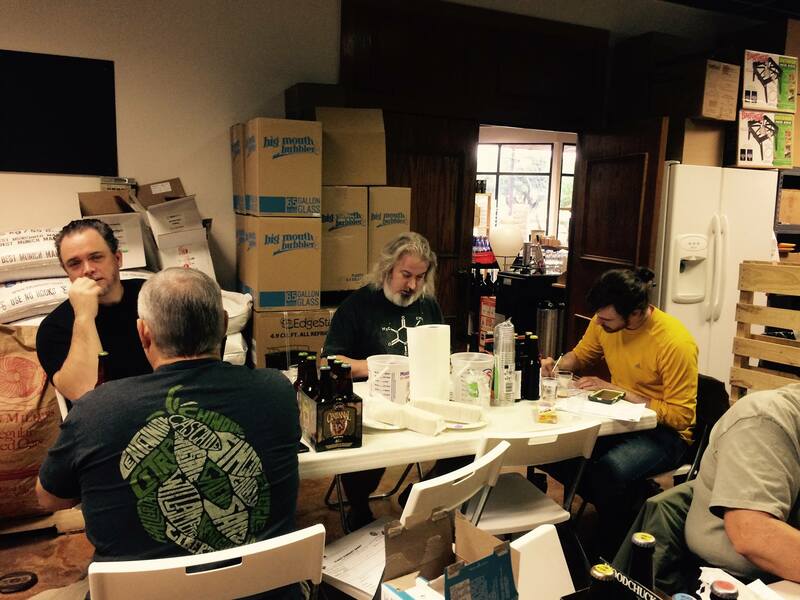 In September 2015, I officially began training to become a BJCP Judge at the great help of friend Neil Spake (BJCP National Judge, Scottish brewing nut) whom ran the BJCP training/examination for the Austin area in 2015. Having passed the online entrance exam (linked here), I studied (meaning tasted, drank, and read) throughout the month and took the tasting exam at the end of September. Recently, I received my grade from the tasting evaluation and achieved a 77 on the tasting exam (needing a 70+ to progress toward BJCP Certified) on my first try, which officially got my foot in the door. At present, I’m officially a Recognized BJCP judge; however, I’m only 1.0 experience points away from the Certified title. Perhaps I’ll get some judging in soon to complete this step. Going forward, I’m not sure if I want to progress toward the National Rank (needing a 80+ on the tasting exam coupled with a written exam), but for now I’m quite happy with my progress. Cheers to that! One of the negative aspects of the book writing from 2014-2015 was the lack of brewing opportunities since the vast majority of my life was spent either writing or performing PhD research. Thus, once both activities started to slow down, I was very happy to spend my much need break in work brewing. At present, I’m happy to report I’ve been quite pleased with an improved quality of homebrew since implementing several equipment items and brewing techniques I recently acquired/implemented. Most notably is my DO meter which I’ve been supremely happy with and has significantly improved the fermentation quality of my last few brews simply since I can directly measure and record aeration levels of wort prior to pitching. More to come on this later. 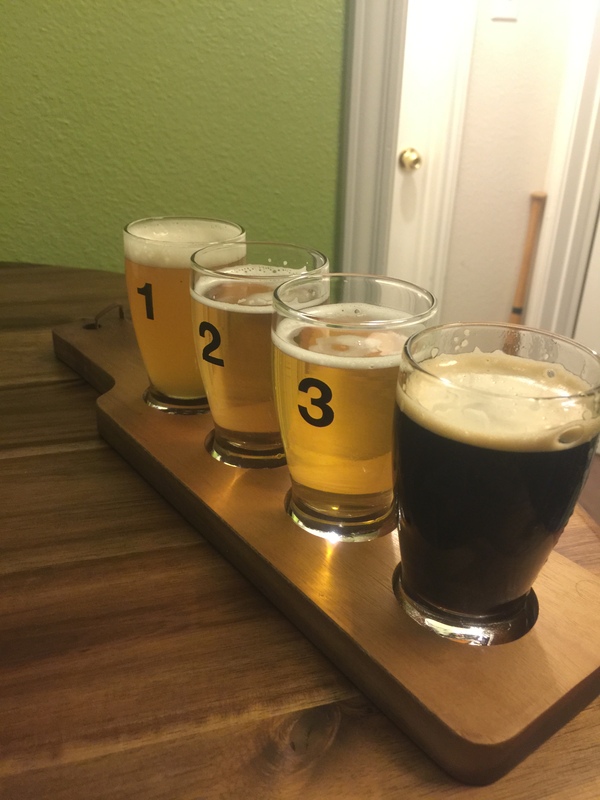 From this, of the past few months brewing, I recently enjoyed a homebrew flight of my favorite and most recent beers on tap in my apartment. Starting with the left most pictured, the Imperial Apricot wheat beer, a 1.064-ish Wheat wine-ish style featuring a secondary fermentation on a f*ck-tun of apricot purée (~1 lb/gallon of wheat beer), is a re-brew of an award-winning apricot wheat beer I brewed in 2012. I’m happy to report that the re-brew came out better than the first. Knowing this, I would enter it into competition again; however, I’m hesitant to ship a few bottlesoff; I just love this wildly fruit forward beer too much. Maybe soon. Next pictured is rather basic Blonde Ale. Smash-y in recipe (Pils malt, Biscuit malt, Hallertau hop) it features the Wyeast 1728 Scottish Ale yeast and is quickly becoming my house yeast strain simply because it can ferment over a wide range of styles. Fermented in the low 60s F, it’ll yield a clean American ale character. Bump the fermentation temperature to the high 60s F and it’ll yield a slightly fruity yet balanced ale character. And lastly, cool it down to the mid 50s F, and it’ll yield lager-like fermentation, perfect of hybrid and pseudo-lager styles. For this Blonde Ale, I used a cool 57 F fermentation temperature (along with a diacetyl rest), which gave the final brew an interesting Bo Pilsner-y quality (without the diacetyl). Overall, a good brew and fantastic yeast. Third pictured is a small-batch simple cider, and by simple I mean simple. Just 2.5 gallons of the least expensive apple juice I could find, Nottingham dry ale yeast, some pectin enzyme, tannin powder, yeast nutrient, quick 14 day fermentation, acid adjustment at kegging, and a two week settling produced a rather basic, but nonetheless tasty semi-sweet cider. At 5% ABV, I can guzzle this pleasant cider by the imperial pint. Will have to make another batch soon before I run out. Last but not least, pictured right is an Imperial Smoked Porter, and it’s just as you think it might be: a big, smoky robust American-style porter. Having previously been pleased with a smoked porter recipe I brewed in 2013 (largely based on Jamil’s in Brewing Classic Styles), for the re-brew, I decided to up the flavor intensity. The motivation for this one is simple: imperial-ize this interesting style in both gravity points and smoke intensity. At ~7.3% it’s not super alcoholic considering its imperial classification, but even at a young age, this brew is just about perfect. Rich malt, loads of dark chocolate character, nice bitterness, and full body along with incredible bacon-y, fireside-y smoke character in the flavor and aroma, makes for a seriously good brew. Will have to use restraint while enjoying at the present; I’m sure this one will age quite nicely as well. How has your new brew year started in 2016? Leave your experiences in the comment section below. Cheers and happy brewing! Well done with your BJCP creditation. Had to look up DO Meter. I aerate after cooling by using the long drop from the boiler to fermenter. Usually gives me good results (so far) but I usually brew at or below 5abv. Like the sound of your smoky porter. Thanks; very glad to get the basic certification steps completed! Also, I’m a bit of an aeration nerd. In particular, I noticed a large impact on attenuation when using forced aeration via an oxygen cylinder versus carboy shaking when using harvested yeast and decided to go the next step by measuring aeration levels in my wort. I’ve noticed fermentation character and attenuation benefits aerating up to 16 ppm with re-pitched yeast. More info to come on using DO meter and its potential benefits in future posts. Thanks for reading! Cheers! Also, there will be a recipe soon to come on the Imperial Smoked Porter. Will fill you in when the time arises. Thanks! Yet to brew my first 2016 batch, but 2015 ended strong. Nailed a great Hefeweizen and APA in the fall, followed by a Spiced Scottish Ale that received my highest BJCP score yet (a 35 in the Specialty Beer category). Finished 2015 by making a switch to kegs for a semi-sweet cider and what I am dubbing my Nutty Professor Brown Ale. Always look forward to your ideas and insight for small space brewing. Good to have you back on the interwebs. All good news here. Congrats on the high score; keep up the good brewing! Also, I don’t blame you for moving to kegging; it can be quite convenient albeit a bit bulky in apartment brewing. Thanks for reading; I appreciate the kind words and feedback. Cheers! Really cool. Care to share the Imperial Smoked Porter recipe? Sounds quite delicious.